Over 140,000 South Sudan refugees who fled the country at the height of the civil war have returned home six months after a peace deal was signed between warring factions of President Salva Kiir and Dr Riek Machar. 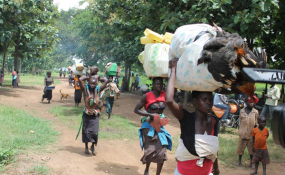 The returnees, according to South Sudan's Ministry for Humanitarian Affairs and Disaster Management came from Uganda, Ethiopia, Central African Republic and Sudan. Peter Kulang Gatwech, Undersecretary at the ministry told The EastAfrican on Thursday that the government was working with the United Nations High Commissioner for refugees and the International Organisation for Migration to rehabilitate, resettle and reintegrate the returnees into their previous communities. "We have set up an emergency fund through which we provide foodstuff, medical care and a few other social services to individuals and families of returnees," Mr Gatwech said. South Sudan plunged into a civil war in December 2013 pitting President Kiir against his sacked deputy Dr Machar. More than two million of its citizens fled the country. A peace deal brokered by the Intergovernmental Authority on Development ensured a ceasefire and return of relative peace in October last year. Mr Gatwech said returnees will take six to 12 months under the care of the UN and government but are expected to provide for themselves thereafter. Verification of ownership of property such as land will be conducted. The government is also organising national dialogue at village level as part of the re-integration. Although the current number of returnees remains small, the government had not expected to make repatriations at this time because of a wide spread doubt among the refugees on whether the peace deal will hold for long. In the Ugandan refugee camps, this newspaper has reported earlier that many South Sudan refugees do not wish to go back home immediately as they believe the peace deal could come apart forcing those who make an early return into fresh flight.